See Cirque Dreams: Holidaze on Opening Night! An international cast of more than 30 multi-talented and brilliantly costumed artists come to life and perform astonishing feats of disbelief. Experience gingerbread men flipping midair, toy soldiers marching on thin wires, snowmen daringly balancing, icemen powerfully sculpting, penguins spinning, puppets dancing and reindeer soaring high above a landscape of holiday wonderment. 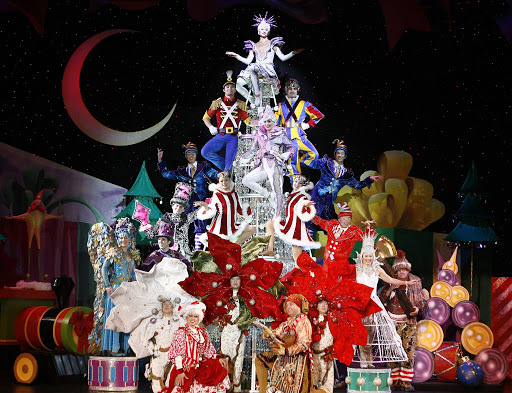 An original music score and seasonal favorites accompany hundreds of spectacular costumes and holiday dreams in a setting of gigantic gifts, colossal candy canes and 30-foot towering soldiers. The perfect way to come in from the cold, forget the holiday stresses and rediscover the magic of the season. For more information or to purchase your tickets, visit http://www.attpac.org. Click on the link below for more information and a video on this amazing show! Do you want to win tickets to see Cirque Dreams: Holidaze? North Texas Kids is giving away 4 tickets to see the opening night performance of this spectacular Holiday show on Tuesday, December 18th at 8pm, at the Winspear Opera House. To enter this contest, “LIKE” the North Texas Kids page on Facebook and leave a comment below to tell us that you have liked our page or already like our page, if you’re already a fan. ALSO tell us what your family’s favorite Holiday tradition is. Contest ends Thursday, December 13th. Winner will be notified by email; the email used will be the one you use to leave your comment below. Liked your page! My family’s favorite Christmas tradition is eating PIZZA on Christmas eve. We’ve done pizza every year as an easy and stress free way to entertain family and friends w/o having a mess to clean up before Christmas morning. I like your page and Christmas breakfast is my favorite tradition! I like your page on FB. My favorite holiday tradition is baking cookies with my daughter and going to look at Christmas lights. Our family tradition is making a birthday cake for Jesus! Celebrating Jesus and being so thankful for all his blessings! Already a fan! I love going to the candle light Christmas Eve service! Decorating the Christmas tree… our kids LOVE IT and it’s always a special time. Already a fan! Our families favorite tradition is viewing Dallas’ beautiful holiday lights by car while sipping hot cocoa! I’m already a FB fan. My favorite holiday tradition is helping the kids leave cookies and milk for Santa. I have liked you for a while. My favorite holiday tradition is baking cookies with my kids, and letting them decorate them for Christmas Eve. Hello, I already am a fan on FB and liked your page a long time ago. My favorite tradition is baking cookies with my kiddos and seeing Christmas movies during the days off together. I already like your page on Facebook. You guys are great! My husband and I have started a tradition of going to the candlelight service at our church and then we go home and having communion, just the four of us, in remembrance of our Lord Jesus Christ and His birth. On Christmas Day we make a cake and sing “Happy Birthday to Jesus”. I’ve already a fan. Our favorite tradition is reading a Christmas book every night in December up until Christmas Day. I liked the page I’m a fan!!!! Our family’s favorite holiday tradition is baking Christmas cookies…..a lot of them….20+ different types. My daughter, son and I bake all day and we will share them with teachers and staff at our elementary school!!! Already a fan! We love to make my Granny’s Christmas cookies! Liked your page! We have a family tradition of having a big dinner on Christmas Eve instead of Christmas Day, reading the Night Before Christmas, followed by the story of Jesus’ birth. We always have a fire in the fireplace and roast marshmallows. We get to open one present (it is always new pjs) and watch a Christmas movie!! I’ve been a big fan of NTK for a long time and like that they post so many family friendly shows, events, and activities that my family and I are not aware of by any other media source! We would love to see *Cirque Dreams*…as we are unable to see A Christmas Carol (or Scrooge) this year. It has become a holiday tradition for our family to see the play at a local community theater or high school production. I love to keep up with kids events and often include them in my classroom newsletter, I often find holiday outings for my family. We love to drive around looking at holiday lights while sipping hot cocoa! I’m already a fan on facebook! Each year we have fun writing letters to Santa, and opening our advent calendar. We also think service is an important part of the Christmas season, so each year we take part in a toy drive in our area. We have fun going as a family to pick out the toys we will donate! Just liked North Texas Kids Page! I love to receive information about kid activities around North Texas! Thanks! & Happy Holidays! Super FAN, tradition is seeing some form of the Nutcracker! Already a Facebook fan. Our favorite holiday tradition is listening to Christmas music on Christmas morning while enjoying my grandmother’s quiche Lorraine, cut oranges with powdered sugar and mimosas (for the adults!). More than food and drink… this is wonderful family time together with multiple generations. We always go to my in-laws. Our favorite family tradition is sipping on hot chocolate while baking cookies for Santa on Christmas Eve! I am already a fan! Our family elf, Fred, joins us nightly leaving inspiration to be good. We also count down to Christmas with our avent calendar. We also make cookies and decorate them. Then we load up in the car and look at Christmas lights while listening to Christmas music. Our family’s favorite tradition is getting a new ornament every year. Each child gets one specific to his year. This year my Kindergartener will get one to mark his 1st year in school milestone and our 1 year old will get a sweet little toddler holding a blankie and pacifier. We love, love, love reminiscing every year about the special ornaments we’ve collected. Definitely a tradition that will last in our home forever. We’re already fans! Our family’s favorite tradition is getting a new ornament every year. Each child gets one specific to his year. This year my Kindergartener will get one to mark his 1st year in school milestone and our 1 year old will get a sweet little toddler holding a blankie and pacifier. We love, love, love reminiscing every year about the special ornaments we’ve collected. Definitely a tradition that will last in our home forever. We’re already fans! Our family’s favorite tradition is getting a new ornament every year. Each child gets one specific to his events during that year. This year my Kindergartener will get one to mark his 1st year in school milestone and our 1 year old will get a sweet little toddler holding a blankie & pacifier. We love reminiscing every year about the special ornaments we’ve collected. Definitely a tradition that will last in our home forever. Am a fan. Have been a fan. Love getting news and tips from you guys. My favorite holiday tradition is setting out carrots, milk and cookies for Santa. My husband hates sweet treats so I always get to play Santa and I always make sure to leave at least 2-3 cookies with bite marks in them so my son can have field day with it. I have already liked the Facebook page. Our favorite holiday tradition is putting together and playing with our Santa train set. Liked the page! Our favorite family tradition is making cookies for Santa on Christmas eve. Our newest tradition is receiving a visit from our elf on a shelf Twinkle! Liked the Page! Our favorite tradition is making cookies for Santa on Christmas Eve although our newest tradition is getting a visit from our Elf on the Shelf Twinkle each year. I want to soooooo win these tickets to see Cirque Dreams: Holidaze!! We made ornaments for the Highland Village nursing home last night and this will be a new tradition for us. I love your Facebook page! My family exchanges ornaments with each other every year. It’s nice to look back on the ones that we have and reminisce! We are already fans! Our favorite Christmas tradition is going to the Dallas Children’s parade. I’m already a fan!!! Every year we would rent a carriage and go look at Christmas lights either in Highland Park Village or Highland Park neighborhoods. So much fun! We already like your FB page. What a fantastic opportunity to see a Cirque show! Definitely a memory- maker! Our favorite holiday tradition is the fun holiday crafts we do together. We keep some for decoration or the scrapbooks and give some as gifts. Already a fan! We like to see the Nutcracker Ballet (in any form: student, abbreviated, professional) on Christmas Eve and then go to midnight services. I am a long time friend “like”of NTK! My favorite tradition is we go see a Christmas themed show each year. Some are more vibrant or profound than others but we always make time to do this together. It always includes a fancy dinner at Pappadeux as well with Bread Pudding for dessert! I’ve been using NTK for years. I love their craft ideas. I’m a room mom and have found that the crafts are easy, inexpensive, and are really cute. I also love getting updates on all of the local events for kids. We have always wanted to go see one of these shows. Just the pictures of the Holidaze show lead you to believe that you’d be mesmerized by beautiful, colorful, and magical performances. My son has severe allergies to animals so we cannot attend a circus and I think he would fall in love with this show. One of our favorite family traditions is to go to Santa’s Village, followed by looking at Christmas lights and riding a Christmas train, then home for cocoa and watch the Polar Express. I’ve liked your page for a while now! Never seen a show like tho before. WINNER ANNOUNCEMENT: Congratulations to LeAnn for winning this giveaway! Hope you and your family enjoy the show!